This is a picture of my left hand that I just finished tattooing myself. I once was a tattoo artist but I quit tattooing for more than 15 years so I have some practice to do to get back on track ! My left hand was available and willing to play the guinea pig. I will need help for the right hand though. hi, my name is Richards, I live in Goias Goiania Brazil, I’m 23 years old and this is my tattoo. Hi!, my name is Jonathan Malraisont Kautt and I’ve been living in Thailand for over 17 years. I just got this set done a few hours ago at Tatta Tattoo Studio here in Chiang Mai.They were done by a good friend and tattoo artist Em Vans. I wanted to get them done for a while now, and 2 days ago, I decided to get an appointment and Voila!!!. I chose the words HAVE HOPE for the simple reason that I believe that no matter what happens in our lives, no matter what situation we’re in, we should never lose hope, we should always believe in our hearts that we can make this world a better place and believe that we can!! !……everybody, HAVE HOPE!!!! Hi World! 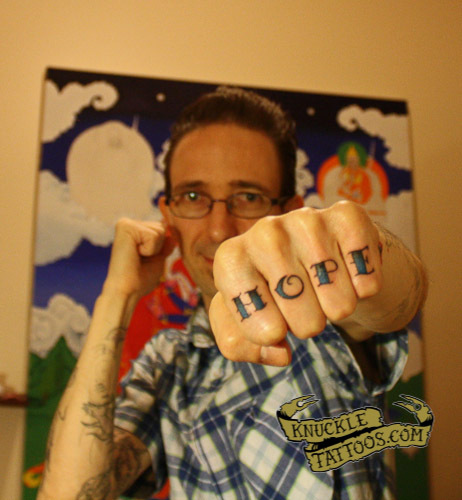 My name is Hope and these are my knuckle tats. I was cursed with these bad boys at age 16, when I sobered up the next morning sometyhing in my gut told me knew I was pretty much fucked as far as the corporate job world was concearned. When I turned 18 I went into the shop and got the second word changed to Fate , the T looks like an upside down cross (the only way to cover that damn L) again I screwed myself once again; I have even more mormons at my front door.